The most common flea found on cats and dogs is the cat flea (Ctenocephalides felis), rarely rabbit fleas or hedgehog fleas are found on cats. The most important source of fleas is newly developed adult fleas in pupae in your house. Adult fleas live and feed on animals but the female lays eggs which fall off into the environment, under favourable conditions these eggs develop first into larvae and then into pupae. The pupae contain adult fleas which lie in wait for a suitable animal host. Modern carpeted centrally heated homes provide ideal conditions for the year round development of fleas. The highest numbers of flea eggs, larvae and pupae will be found in areas in the house where pets spend most time such as their beds, the furniture and so forth. Even though fleas may be in your house you probably won't see them; the eggs are too small to see without magnification and the larvae which are just visible migrate deep down into carpets, furniture or cracks in floors away from the light. Although you are only able to see the adult flea, there are actually 4 stages of the life cycle. The adult flea constitutes only about 5% of the entire flea population if you consider all four stages of the life cycle. Flea eggs are pearly white and about ½ mm long. Fleas lay their eggs on the animal, but the eggs fall off into the environment. The eggs make up 50% of the flea population. They hatch into larvae in 1 to 10 days, depending on temperature and humidity. Flea larvae are slender and about 2-5 mm long. They feed on organic debris found in their environment and on adult flea faeces, they avoid direct sunlight and actively move deep into carpet. They live for 5 to 11 days and then pupate. Moisture is essential for the survival of these immature stages of the flea. Larvae survive best in the protected environment of carpet or in cracks between hardwood floors. They thrive in warm conditions. Following complete development, the mature larvae produce a cocoon in which the next step of development, the pupa, resides. In warm, humid conditions, pupae become adult fleas in 5-10 days. However, the adults do not emerge from the cocoon unless stimulated by vibration, carbon dioxide, or heat. Pre-emerged adult fleas can survive up to 140 days within the cocoon, during this time, they are resistant to insecticides applied to their environment. Because of this, adult fleas may continue to emerge into the environment for up to 3 months following insecticide application. When the adult flea emerges from its cocoon, it immediately seeks a host because it must have a blood meal within a few days to survive. It is attracted to people and pets by body heat, movement and exhaled carbon dioxide. It seeks light, which means that it migrates to the surface of the carpet so that it can encounter a passing host. Following the first blood meal, female fleas begin egg production within 2 days. Egg production can continue for as long as 100 days, which means that a single flea can produce thousands of eggs. This entire life cycle (adult flea --> egg --> larva--> pupa --> adult) can be completed in 14-21 days with the proper temperature and humidity conditions. This adds to the problem of flea control. What effect do fleas have on my pet? If untreated, the female flea will continue to take blood for several weeks. During that time, she will consume about 15 times her body weight in blood. Although the male fleas do not take as much blood, they too contribute to significant blood loss from the host animal. This can lead to anaemia in sick or very young animals. Many animals live with fleas but show minimal signs, but some animals become allergic to flea bites. If these animals are exposed to fleas they become very itchy and develop skin disease. The flea acts as the intermediate host for the tapeworm (Dipylidium caninum). Tapeworm eggs which are shed within tapeworm segments in cat and dog faeces are eaten by flea larvae which develop into infected fleas. Animals become infested by eating infected fleas during grooming. Any animal with fleas is likely also to have a tapeworm infestation. What can I do to rid my pet of fleas? There are 2 aspects to successful flea control - control of fleas on your pet, and control of fleas in the environment. If your pet remains indoors and you do not have other pets that come in from the outside, environmental control is relatively easy. However, most animals go outside and can bring new fleas in. Many products are available to kill adult fleas on pets, most of these are not very effective as they work for only a few hours after application. After a few hours, any flea that jumps on the animal will survive. For this reason we do not recommend powders, shampoos or sprays. The most effective product for treating pets is Stronghold, this is available as a spot-on. It is very safe and effective. It is very easy to use, a few drops are applied to the back of the animal's neck. One application lasts for a month. 1. Household treatment using sprays or powders. Most of these will kill adult fleas only, and will not affect the other stages of the life cycle. Indorex also contains a drug which inhibits development of the larva for up to a year. The whole house should be treated, fleas will move into every room even if your pet doesn't. Remember to spray under cushions and furniture as well as out of the way places to which your pet may have access like the airing cupboard or the car. 2. Program is a treatment which prevents fleas ever becoming established in your home, it is available in 2 forms. There is an oral form which is given in food once a month to all the dogs and cats who live in the house, there is also an injectable form for cats which is given every 6 months. The drug is taken by the fleas when they bite and interferes with the ability of the egg to hatch, effectively sterilising the fleas. The few fleas which may be picked up during social contact outdoors are not killed, but they die off naturally quite quickly, or are groomed out by the pet. 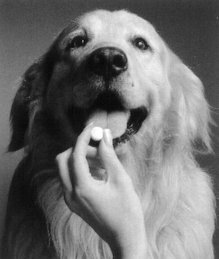 Program is quite safe for any age of dog or cat, in pregnancy, during illness, and can be given alongside any other medication. It has no harmful properties for mammals or for the environment - the active ingredient interferes with chitin formation, mammals do not have chitin so cannot be affected by the drug. Are insecticides safe for my pet and my family? All the insecticides that we recommend are safe for animals, humans and the environment provided the manufacturer's instructions are carefully followed. Certain types of pets (e.g. fish, amphibia, reptiles and invertebrates) may be particularly susceptible to some products. Do not use any flea control products in the room in which these pets are kept without first checking with us. I have not seen any fleas on my pet, why has flea control been advised? Fleas are easy to find if an animal is heavily infested. If fleas are present in smaller numbers it can be harder to see them and they move fast. Try looking on your pet's belly, around the tail base and around the neck. Sometimes adult fleas cannot be found but "flea dirt" can be seen. This is faecal matter from the flea which contains partially digested blood and is a good indicator of the presence of fleas. Flea dirts are small black specks or coiled structures; if you are not sure place them on damp white tissue and they will dissolve leaving a reddish brown blood residue. Flea dirts may be found in your pet's bedding even when they cannot be found on the animal. In animals that develop an allergy to fleas one of the symptoms is excessive grooming. Cats, particularly, are very efficient at removing debris from their coats using their tongues and may succeed in removing all evidence of flea infestation i.e. adult fleas and flea dirt. One of the commonest causes of feline allergic skin disease is flea allergy. To investigate this possibility your vet may advise rigorous flea control even though no fleas can be found. If the cat's skin problem improves with flea control then it suggests that flea allergy is involved.